Discover the unique sight of Half Dome when visiting Yosemite National Park, a gigantic granite dome with a near vertical face, offering a challenging climb for novices and experts alike. 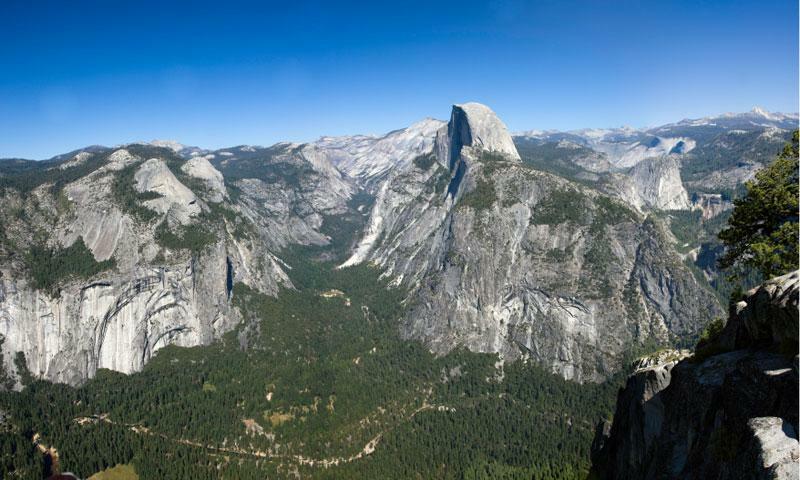 Have you ever seen Yosemite from atop its most iconic summits? This is the best way to appreciate the expanse of Yosemite and the awe it creates. Click for rates & options. Half Dome is one of Mother Nature’s wonders and one of the most recognized features of Yosemite National Park. Many try and see the magnificence of this rock formation using the Half Dome Webcam, but the best way to experience its beauty is to visit Yosemite, even climbing its face on a set of cabled steps. Half Dome Yosemite is at the eastern end of Yosemite Valley. You can find the trailhead to Half Dome by driving into Yosemite Valley, watching for signs for Curry Village then as you head into the Curry Village area watch for signs to the trailhead. The stairs to climb Half Dome are removed from mid-October to May, so plan your trip for between May and mid-October. 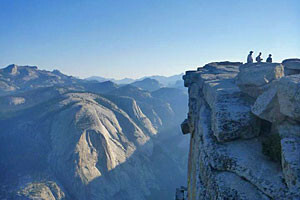 The best way to experience Half Dome is to take the Half Dome trail, a daylong hike of 8.5 miles. You are assisted for the final 400 feet with a staircase with steel cables to hold onto. Once at the top, the panoramic view is amazing. You can also hike this trail by breaking up the trek and camping in Little Yosemite Valley. Permits are now required to hike this route on Fridays, Saturdays and Sundays as well as Federal holidays, due to the huge crowds that were arriving to ascend this trail. This is a strenuous hike! Half Dome climbing in the true sense is also available, with more than a dozen routes leading up from the valley. You can climb the vertical northwest face, the south face and the west shoulder. Originally, local Native Americans called Yosemite Half Dome “Tis-sa-ack.” This was the name of a Mono Lake Indian girl from one native legend.